It’s baby’s first Christmas, let the holiday photoshoots begin! Your Christmas baby photography skills are about to explode! Did you know you don’t have to be a professional photographer or even own a professional camera to take adorable and quality photos of your baby? All you really need is a good cell phone camera and a little imagination, and you too can produce gorgeous photos of your baby worthy of bragging about! In this read, I’m going to give you a few different Christmas baby photo ideas and how to execute them like a pro! Use the save button at the top to pin your favorite images on Pinterest or where it says “share” at the bottom of the post! I bet you want to capture the perfect Christmas photo of your baby that you can proudly share on social media, use for Christmas cards and many other custom creations. We can never have too many pictures of our babies, right?! You’ll learn how to create the perfect scene for four different baby Christmas photo options you can do in one spot of your home in less than an hour! The reason why I use portrait setting is because I really like the blurred background it creates. This effect is called bokeh and it’s commonly seen in professional photography. If your cell phone camera does not have an option to achieve bokeh, you can find apps like Bokeh lens that will do the trick for you afterward! It’s so important to pay special attention to the lighting in the room and natural light is always preferred. Try and choose a space and direction that natural light illuminates most and place your baby facing that light. Wait until later in the day when natural light is softer to avoid harsh sun spots and streaks. If you really get into home photography and you want to upgrade your photo skills, I recommend investing in a ring light, like this one. The above photo is your quintessential baby’s first Christmas photo. You see the bright pops of red and green, the Santa hat and a glistening Christmas tree in the background. This holiday photo of baby is the perfect way to capture Christmas is one shot! What you’ll need to pull this photo off. You can see how I intentionally cropped this photo of baby with a present to give it a more editorial feel. Doing this simple technique is often over looked when taking photos of your baby at home, but it can really add a professional feel. Plus, taking the pressure off of your baby to perform for every shot you want to get can make the experience much more laid back and fun! This photo idea is probably one of my absolute favorites – you must give this photo idea a try! My baby loved playing with these lights, it actually ended up being a great sensory activity as well! Place your baby a few feet in front of a lit tree on a Christmas blanket and get creative with a hat or bloomers. Plug in the lights and let your baby be his or her adorable self! Make sure to check the lights after a little while incase they start to get too warm. Tip: You do not have to wait until it is dark outside to achieve this Christmas lights photo. This particulate shot was taken in the early afternoon and we still managed to get the glowing effect. How adorable and unique is this shot!? I don’t think your baby will have any opposition to laying under a bright and colorful Christmas tree. However, the family cat will probably be a little envious! This Christmas baby photography idea took seconds to snap and is so darling! How do I make my version look like this? 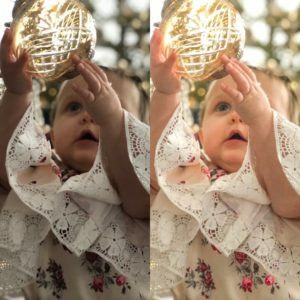 To create this photo identical to the one above, make sure you are standing directly over baby and paying special attention to how the camera is focusing. Tip: You want the focus to be on your baby and not primarily on the tree. If you like a particular shot, but notice too much of the tree is in focus, use the bokeh app to blur some of it out a bit! One word for this photo, precious. When it comes to at home photography with your baby, sometimes, you have to work with what you get. Not every shot is going to be perfectly posed. Take this shot for instance, half of my baby’s face is covered, but it doesn’t take away from how sweet this photo is. Moral of the story, don’t feel like you can’t get great photos of your baby when they are less than cooperative. After-all, beauty is in the eyes of the beholder. The last step in nailing baby Christmas photography and making your photos look professional, is the editing. I like to keep editing fairly simple. Usually, minimal corrections need to be done in order to make the right enhancements. When it comes to editing a picture of your baby, having a light hand works best. The last thing you want to do is wash out your babies’ delicate skin tone or worse yet, make them look harsh. What should I use to edit my photos? Recently, my go-to editing app has been Adobe Lightroom. Within color, you can also custom mix eight tones ranging from red to pink. Take advantage of these adjustments, they can add a lot of creativity and customization to your photos. There you have it, 5 darling Christmas baby photography ideas you can do at home and in less than an hour! I hope you feel excited about getting creative and capturing some or all of these photo ideas for your baby’s first Christmas! Try the bokeh effect that will set your photo apart from the rest. Choose the best spot in your house for natural light and always have your baby facing that light. Avoid bright and sunny spots that will create harsh contrast in your photos. Edit your photos with a light hand and make small changes that will beautifully enhance them. 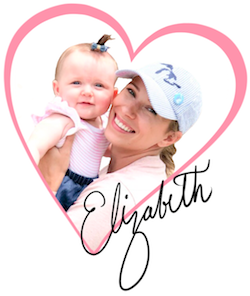 Head on over to the Love Our Littles’ Store and find a unique and original piece for your baby! Now accepting custom orders!